While in Rochester last weekend, Dad and I got the baking bug and decided to make a loaf of cheese bread from a recipe in Cook's Illustrated Holiday Baking. Before we realized it was a quick bread, Dad had hauled out a Hobart-sized Kitchenaid mixer and a barrel of bread flour. Alas, it was just boring old quick bread! But it turned out quite delicious. It was definitely best almost right out of the oven, with the internal cheese gooey and the external cheese crusty. But it wasn't bad toasted the next day with sloppy joes. 2. 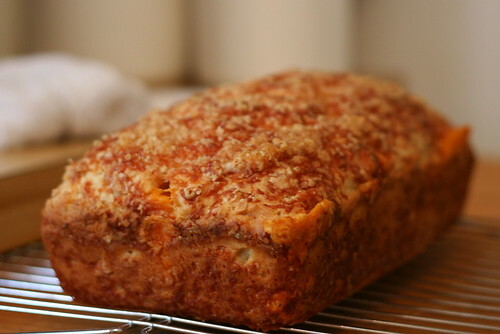 Spray 9x5 loaf pan and sprinkle with 1/2 cup parmesan. 3. Whisk flour, baking powder, cayenne, salt, and pepper. Add cheddar to coat. 4. Whisk together milk, butter, egg, and sour cream. 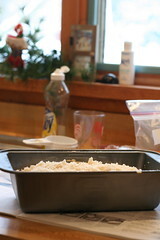 Fold into dry ingredients. Pour into pan. 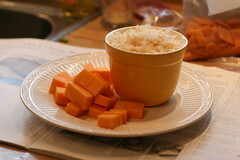 Sprinkle with remaining Parmesan cheese. 5. Bake until golden brown and it passes the toothpick test (be careful not to mistake molten cheese for raw batter! ), about 45-50 minutes. Cool slightly and turn out of pan. Dad gave me a few new items for my spice inventory and when I got home, a box from Penzey's was waiting for me. Spice overload! I couldn't shoehorn everything into my humongous spice cupboard. Which is ridiculous. After all, it's humongous! So up I climbed and out I cleaned. 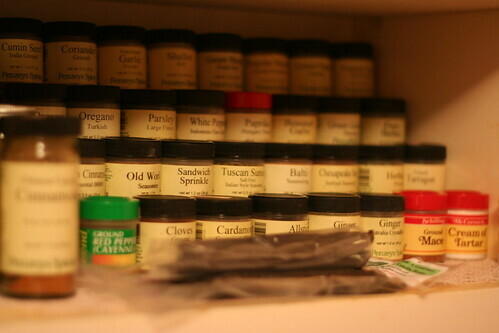 And now I can't stop beaming at my newly organized spice cupboard. I even rigged stadium seating for my spices. Don't they look happy about it?